This weekend I’m very excited and humbled to be participating in two spectacular art events, both of which happen to be organized by tireless, brilliant women who are passionate about creating innovative collaborative contexts for local art. The first is LxWxH, the artist box set curated by Sharon Arnold. A thoughtful and accomplished visual artist in her own right—check out Joey Veltkamp’s review of her recent solo show at the Cornish Alumni Gallery—Sharon is equally known in Seattle as the author of the blog Dimensions Variable and creator of LxWxH, a periodical series of limited edition boxes containing original artworks by two artists and an essay or written piece. Jen Graves and Joey Veltkamp have both written lovely posts about LxWxH, for my part I will just add that I really enjoy the fact that LxWxH transcends boundaries by simultaneously operating as a venue, a publication, and an artwork. I contributed an essay called THE CURRENT to the September-October 2011 issue of LxWxH, which includes paintings by Brian Cypher and Allyce Wood. Brian Cypher. 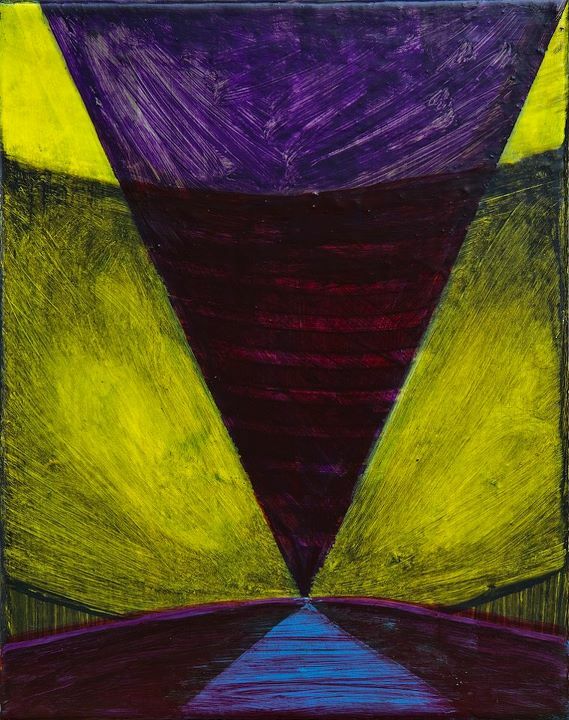 Painting for LxWxH, 2011. 10 x 8 in. An artist is an individual who, by virtue of compulsively engaging in documentary activities surrounding his or her own feedback loop of subjectivity, provides us with a microcosmic roadmap of the nature of subjective experience. The creative “voice” emerges from the feedback loop of the artistic process much as the subjective experience of “self” arises as the by-product of so much recorded perceptual data by our neuronal hardware. When I first encountered Brian Cypher’s work a couple of years ago, I was struck by the sheer evidentness of the feedback loop in which he was operating. While they may not share a palette or a single shape in common, every one of Brian’s paintings became immediately recognizable to me as a character in the same big story; a part of the pattern self-similar enough to produce a microcosm from which we may, in a sufficiently meditative state, deduce the whole. The launch party for the new issue of LxWxH is this Thursday, September 8 from 5 to 8 pm at Ghost Gallery (in the old Crawl Space spot on Denny and Olive). Facebook invite here. 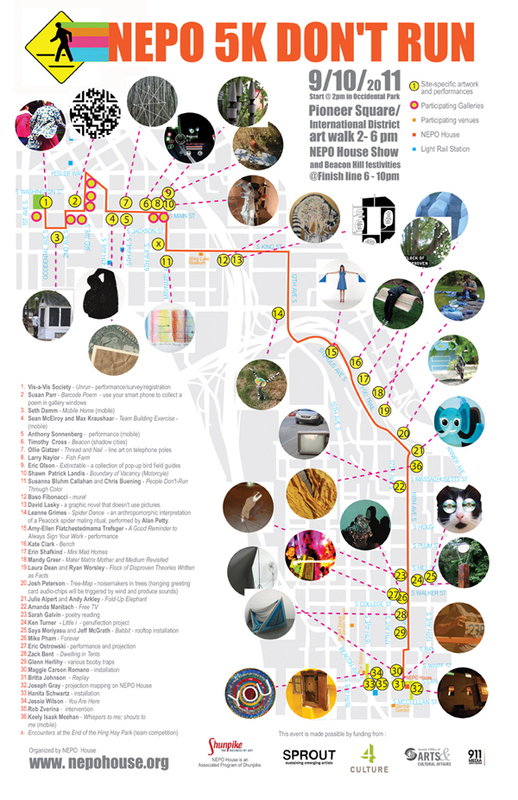 The second event I’m participating in this weekend is NEPO 5K DON’T RUN, a 5K of site-specific art installations along Seattle’s city streets scheduled for this Saturday, September 10. Organized and curated by Klara Glosova (of NEPO House) with much assistance by Amanda Manitach, NEPO 5K includes objects, performances and interactive artworks by over 80 artists. My Midday Veil bandmate David Golightly and I will be performing an audiovisual improvisation as Hair and Space Museum at Klara’s next-door neighbor’s house in Beacon Hill around 9 pm. Coincidentally, this performance is occurring almost exactly a year after our last site-specific improvisational installation A Double Rainbow in Curved Air, which took place last September at Seattle University’s Hedreen Gallery. ~ by emilypothast on September 7, 2011. This Entrance is for the Band!